Richardsonboyz.com is proud to offer the perfect Cooling System for your hot rod. 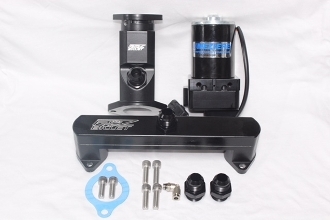 The All-in-One Cooling System gives you the best remote Water Pump on the Market, Meziere's WP136S inline water pump, packaged up with RBZ Billets One piece Water Filler Neck and Cross over tube, We assure you that you will not have a cooling issue on your hotrod. This package comes with the mounting bolts, Fittings of size, and the needed gaskets to fit your BBC.